Business intelligence allows you to analyze your data and effectively make decisions with it. Read this excerpt from Brian Larson to learn more. In Chapter 1, we discussed the fact that business intelligence (BI) should be utilized at all levels of an organization to promote effective decision making. While it is true that business intelligence is useful throughout the organization, the same type of information is not needed at each level. Different levels within the organization require different types of business intelligence for effective decision making. Decision makers at the upper levels of our organizations must look at the big picture. They are charged with setting long-term goals for the organization. Decision makers need to have a broad overview of their area of responsibility and not get caught up in the minutiae. The business intelligence utilized at this level needs to match these characteristics. The measures delivered to these decision makers must be highly summarized. In many cases, each measure is represented, not by a number, but by a status indicator showing whether the measure is in an acceptable range, is starting to lag, or is in an unacceptable range. 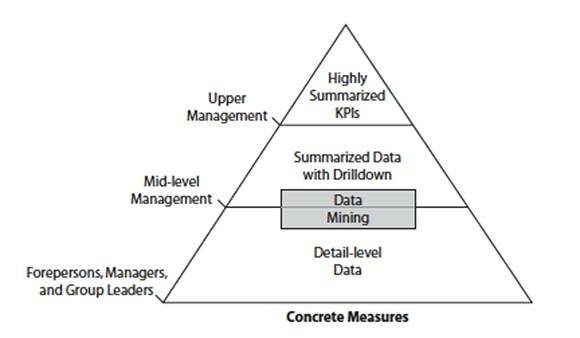 These highly summarized measures are known as key performance indicators. Key performance indicators (KPIs) are highly summarized measures designed to quickly relay the status of that measure. They usually reflect the most vital aspects of the organization. Excerpted from Delivering Business Intelligence with Microsoft SQL Server 2012, Third Edition by Brian Larson (McGraw-Hill; 2012) with permission from McGraw-Hill. For the full chapter, see the PDF. To purchase a copy of the book, please go to Amazon.com. KPIs are used to provide these high-level decision makers with a quick way to determine the health of the essential aspects of the organization. KPIs are often presented as a graphical icon, such as a traffic light or a gauge, designed to convey the indicator's status at a glance. We discuss KPIs in greater detail in Chapter 10 of this book. Because these upper-level decision makers are dealing in long-term policies and direction, they do not need up-to-the-minute business intelligence. 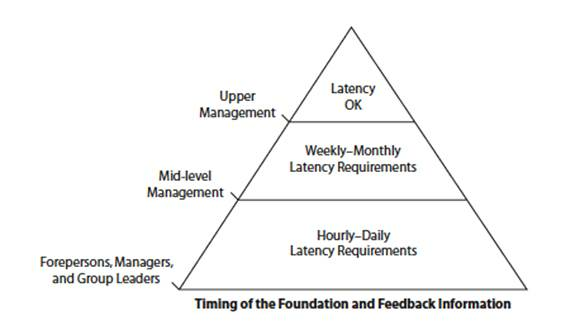 Another way to state this is to say they can have more latency in their business intelligence. These decision makers need to see downward trends in time to make corrections. They do not need to see the daily blips in the organization's operation. The latency of business intelligence is the amount of time between the occurrence of a transaction and the loading of that transaction's information into the business intelligence system. Mid-level decision makers are managing the operation of departments and other working units within the organization. They are setting short-term goals and doing the planning for the functioning of these areas. Mid-level decision makers are still at a level where they should not be involved in the details of day-to-day processes. These mid-level decision makers need business intelligence that is still summarized, but they often need to drill down into this information to get at more detail. Therefore, these decision makers can utilize reports along with interactive systems, allowing data-led discovery. These decision makers can also make use of information from data mining. Because these decision makers are closer to the everyday functions, they may require business intelligence with less latency. In some cases, they may need to see measures that are updated daily. In other cases, these decision makers are looking for trends discernible from weekly or monthly loads. 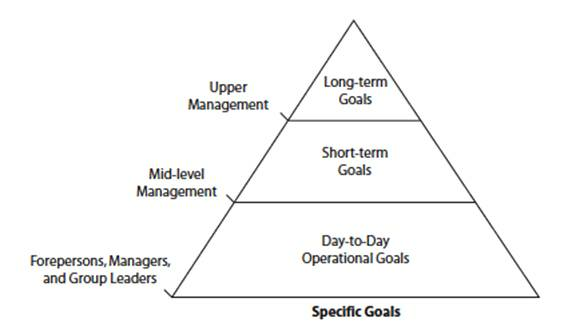 At the broad base of our business intelligence pyramid are the forepersons, managers, and group leaders taking care of daily operations. These people are setting daily operational goals and making decisions on resource allocation for the next week, the next day, or perhaps the next shift. They are planning the next sales campaign or maybe just the next sales call. These decision makers usually need business intelligence systems with high availability and high responsiveness. These decision makers are dealing with the details of the organization's operations. They need to be able to access information at the detail level. In some cases, the work groups these decision makers are responsible for are small enough that they can see the detail for the work group directly without being overwhelmed. In other cases, measures need to be summarized, but drilldown to the detail level will probably be required. These decision makers may utilize some forms of data mining to help discern trends and correlations in daily information. Because these low-level decision makers are managing day-to-day operations, they need to react quickly to changes in feedback information. For this reason, they can tolerate little latency. In some cases, these decision makers require data that is no more than one day old, one hour old, or even less. Brian Larson, MCSD, is currently the vice president of technology for Superior Consulting Services (SCS) LLC, a Microsoft Managed Partner. He served as a member of the original Reporting Services development team as a consultant to Microsoft. Brian has presented at several conferences, including SQL Server Magazine Connections Conference, the PASS Community Summit and the Microsoft Business Intelligence Conference, and has provided training on business intelligence across the country. In addition toDelivering Business Intelligence with Microsoft SQL Server 2012, Third Edition, Brian is the author of Microsoft SQL Server 2012 Reporting Services and co-author of Visualizing Data with Microsoft Power View, as well as books on Microsoft SQL Server 2008 and 2005, all by McGraw-Hill.